You put on an excellent meeting and should be proud of the program you are building. Congratulations, on pulling off the conference, may it go from strength to strength. I am in awe at what you have achieved already since your return to Egypt, an inspiration to us all! The family had an experience to remember for a lifetime. And so have I.
I would like to congratulate you for the organisation of this conference. In my opinion it was a great success. On behalf of Cleveland Clinic Florida I would like to extend our gratitude for hosting us in Egypt. 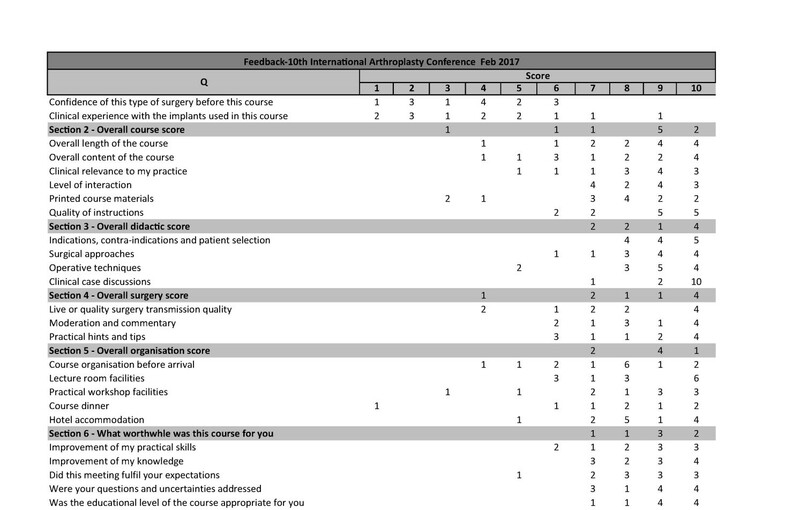 The arthroplasty conference was a success on all levels. We particularly enjoyed chairing our sessions and participating in the discussions that followed. We had a memorable time in your beautiful country and formed many friendships. I would like to commend you on the growth of the conference that has taken place in just one year. Your efforts to make this an outstanding educational and scientific experience are obvious, and the growth of the conference in just one year is something you should be congratulated for, and be proud of. In my humble opinion, I believe it was a very rich conference. The topics were world class. Something I hear usually in major conferences like Hospital for special surgery and AAOS. i agree the attendees were distracted by the beautiful resort. Keep on the good work and i truly believe you and your assistants did an outstanding job of selection of lectures, place food, organization etc. It was a well-organized event with excellent scientific material. The interaction of the delegates was a highlight and we enjoyed that very much. You are doing a great job for Middle East promoting the good scientific care for the patients and teaching much needed in this era. I shall be happy to come again and contribute in any way. YOUR ACTIVITIES IN ORTHOPAEDICS IS WELL KNOWN IN THE ARAB WORLD. I ENJOYED EVERY MINUTE OF THIS YEAR CONGRESS. DEFINTLY I WILL BE PART OF YOUR NEXT YEAR CONGRESS. The meeting was excellent - congratulations on putting on a really interesting conference - I learnt a huge amount, as I always do when hearing about what other people are doing. 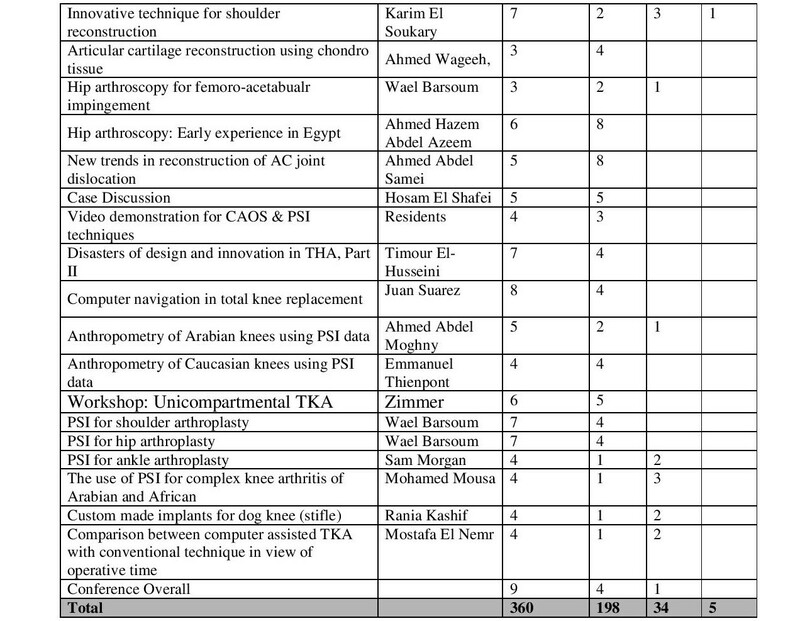 Congratulations for your excellent work which made the Knee Instructional Course in Sharm successful. I would suggest to keep the same format for next year. I enjoyed your wonderful country. I learned a lot from the conference and made some really good contacts. I valued the conference in its content, which made me understand the issues you are facing in orthopaedics in your country as well as the lively discussions with a knowledgeable audience who is eager to learn and improve. Like my colleagues, I would like to extend a sincere thank you for your warm welcoming for this conference in Sharm el Sheikh, from which I learnt many things. It is an opportunity to attend the conference and to learn interesting things during the presentations; I enjoyed these few days I spent in Sharm El Sheikh. It was really a nice event and I am ready for more contribution next time. Topics well covered, venue is brilliant. Good Workshop but it needs more representation from the sponsoring companies, more workshops and a better conference company. 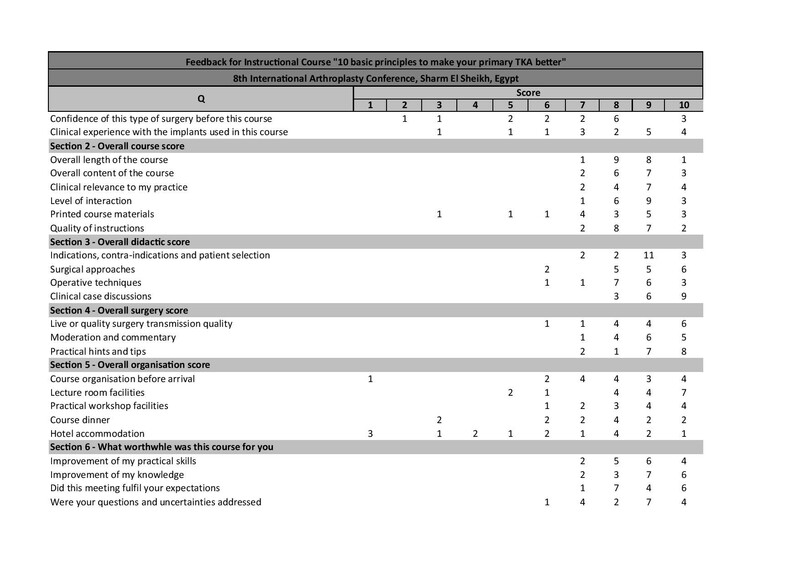 The course is a smash hit; we need to keep it going; Dr.Hofman is a perfect teacher, course hand-outs printed well; computer sessions were very well staffed, although attendance was not great. The course needs to get split over 2 days. Venue was perfect; timing of the conference during January is perfect; faculty was well trained to give lectures and very scientific; preconference course was perfect as overall evaluation and added to me a lot; conference papers were new and presenting relevant points; workshop was very informative and to the point; sticking to the time was perfect; the financial issues were fine and reasonable; organization (pre and during) was perfect. But, the TKR course was very compressed with a lot of information in one day. 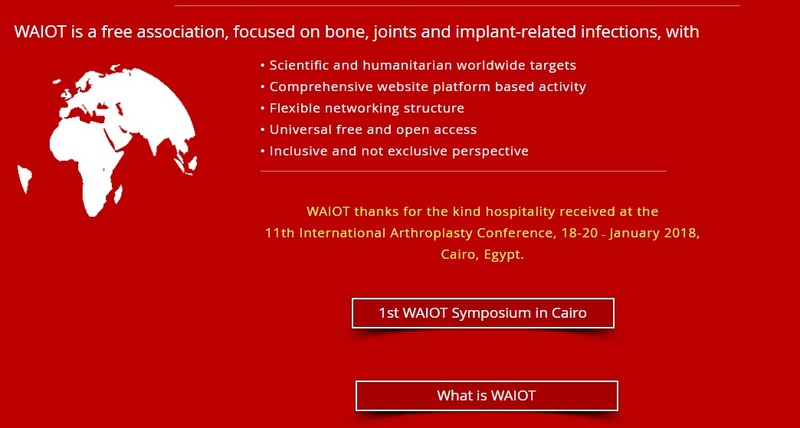 Congratulation for this excellent successful arthroplasty conference. 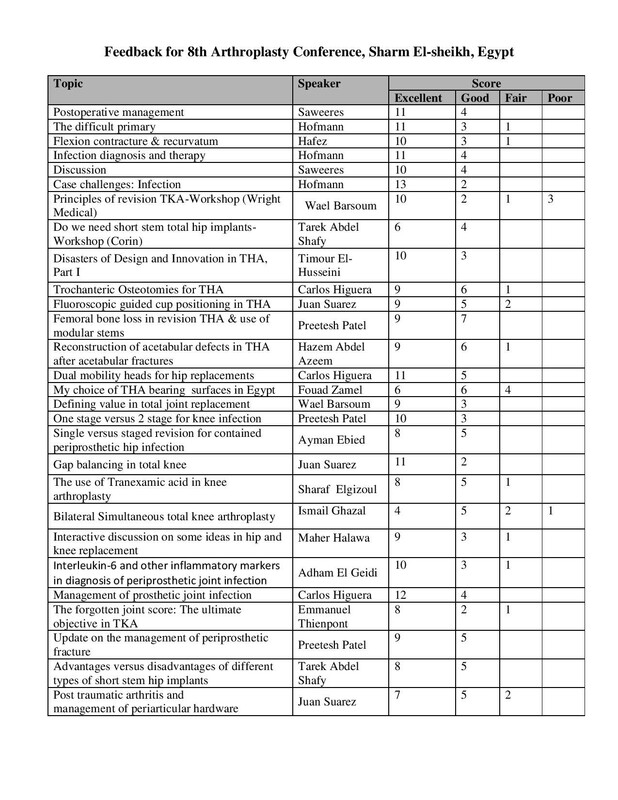 I learnt too much from discussion and updated my information on computer assisted arthroplasty. l also enjoyed beautiful sharm. This is a terrific meeting. I think you'll enjoy it a great deal. I would love to join this conference and in fact, if my wife had anything to do with it she will make it a compulsory pilgrimage! Congratulations for the impressive program. I am sure the conference will be much more impressive. The conference was overall a good experience, as u know I have attended a lot of conferences in UK and internationally, I do not have previous experience with Egyptian conferences. Audience; consider offering young surgeons (? below 35yrs) a discount, may be with medical companies offloading some of the cost? Thank you again for being a superb host - and ALL the work you did to make the course a success. The pictures are Good memory. Thanks for all your organisation for the meeting in Ain Sokhna and it was great meeting many of the local identities in Egyptian orthopaedics. Surgery on the Tuesday was also very interesting and it was good to be part of the introduction of the Oxford UKA into Egypt. I enjoyed the evening and meal at Le Pasha (over the Nile) including the very lively entertainment. Congratulations for this successful meeting. We have already discussed the not ideal location, although it is very close to Cairo. To make the location attractive again I would propose either Sharm or Hurghada for the future. I am glad we had such a resounding success of our Unicompartmental instructional course. It seems there is a great support to having two courses per year. The scientific content is excellent. The morning sessions on Fri and Sat are really condensed, attendants will be there for 4 hours without a break, I suggest 15 mins break in between if possible.